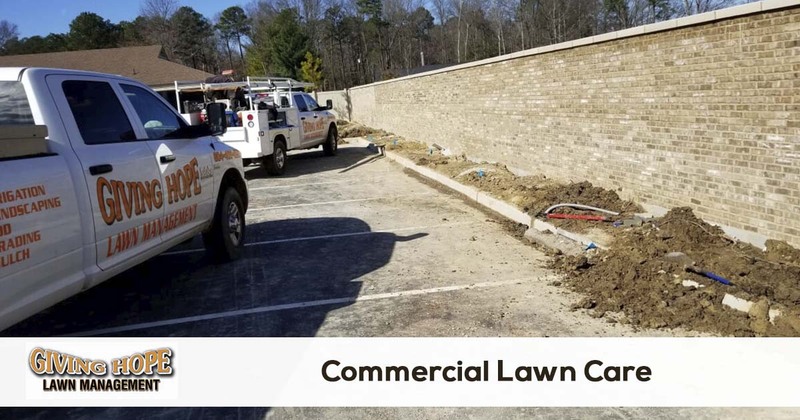 When you need professional lawn care and landscaping services for business or other commercial property, you can count on Giving Hope Lawn Management. We are a locally owned and operated lawn and landscape maintenance company with hundreds of satisfied customers. Caring for yards isn’t exclusive to residential property. As a business owner, you must keep up your curb appeal without spending a fortune. How can you find commercial lawn care services at affordable rates? When you hire Giving Hope Lawn Management for your business, we help you save on quality results! Since 2011, we’ve helped more Richmond VA yards look their best with quality service and lower costs. When you need affordable lawn care for business accounts, we achieve better yards for less every day! Call us for your commercial lawn care needs and see how we can save you more every month. For quality landscaping and lower prices, you can always depend on us! In business, appearances are everything to potential customers. That’s why when you have outdoor areas full of weeds, pests, and overgrown plants, you’ll likely lose out on clients going to a competitor! Better landscape maintenance also helps encourage better employee behaviors. Your team remains much more motivated when they show up to a pristine outdoor area before work! When you need to send the right message to customers, employees, vendors, and more, better curb appeal starts with quality landscaping. That’s why when you need lawn care services for your company, you need us to assist you! No matter what outdoor areas need our help, we can always achieve the best results without higher pricing. Call now for your best options in commercial lawn care solutions! Many industrially zoned properties completely ignore their landscaping because they don’t expect the public to enter. But not handling your lawn care will likely only cause issues later. Most of us ignore our plants because they aren’t overgrown at the moment. But it always feels as if, in the blink of an eye, your lot is full of weeds and tall grasses! Even if you operate on a construction site or industrial warehouse, maintaining grassy areas are crucial for your building’s appearance, as well as the safety of your team. No matter what business you happen to operate, our lawn care experts are ready to service your yards! Don’t ignore your industrial lawn care needs. Instead, choose the experienced landscaping experts and save! It’s easy to get so focused on daily responsibilities that the outside of your building becomes neglected. And once plants get overgrown, it just gets more difficult to maintain them. Instead, it’s always the better choice to continue caring for outdoor areas regularly. With weekly or monthly lawn care, you can better protect your plants. Manicured lawns also promote better curb appeal. When others know that you care for your yards, they know you’re serious about assisting them! Don’t leave your yard to Mother Nature. Instead, allow the affordable team of commercial landscaping experts to service them! For your best in local commercial lawn care, you can always trust Giving Hope Lawn Management. Call today for your best landscaping! Ready to bid out your maintenance for your property or just need a quote for a one time project? Give us a call or you can request a quote online.